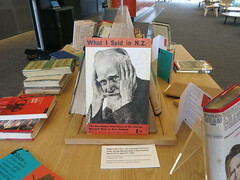 October is Photo Hunt month at Christchurch City Libraries. 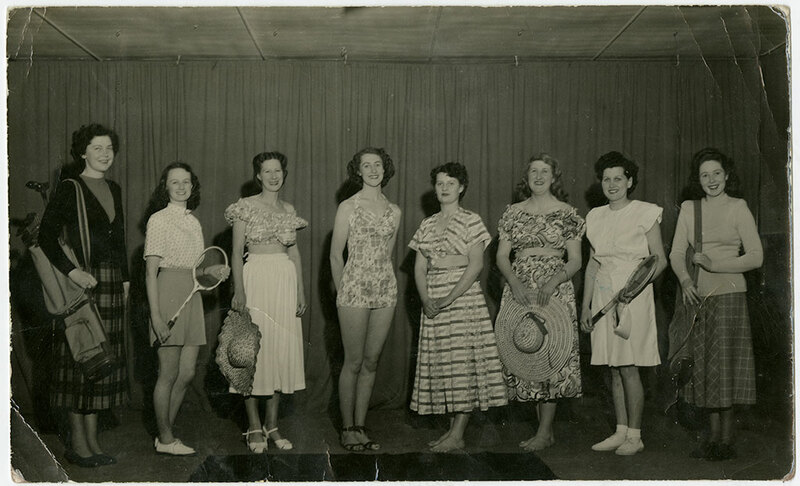 We invite you to share any of your photos and help grow the city’s photographic archive. All entries must be received by 31 October. Summer picnic outing. Kete Christchurch. PH17-AnTo-01. Entry in the Christchurch City Libraries 2017 Photo Hunt. Licensed under a Creative Commons Attribution-Noncommercial-Share Alike 3.0 New Zealand License. 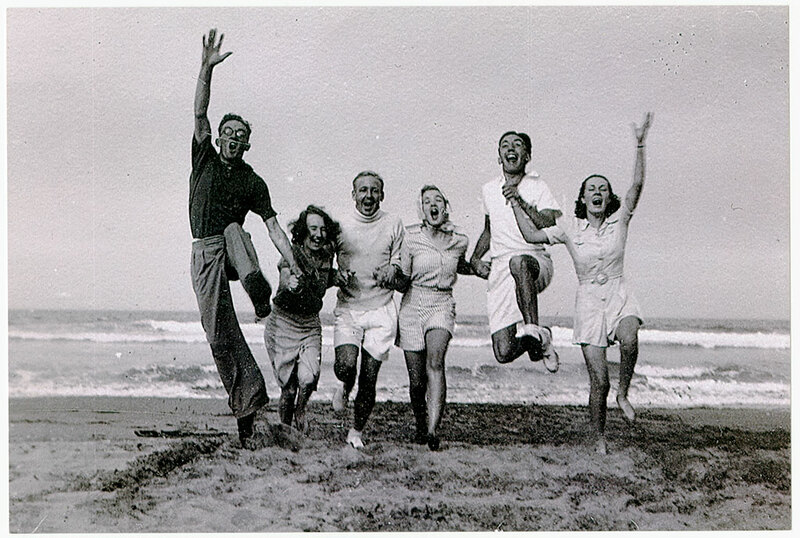 As described by a Photo Hunt entrant in 2017, “This photograph is of my Uncle, Aunty and cousins on a summer picnic outing around 1954. 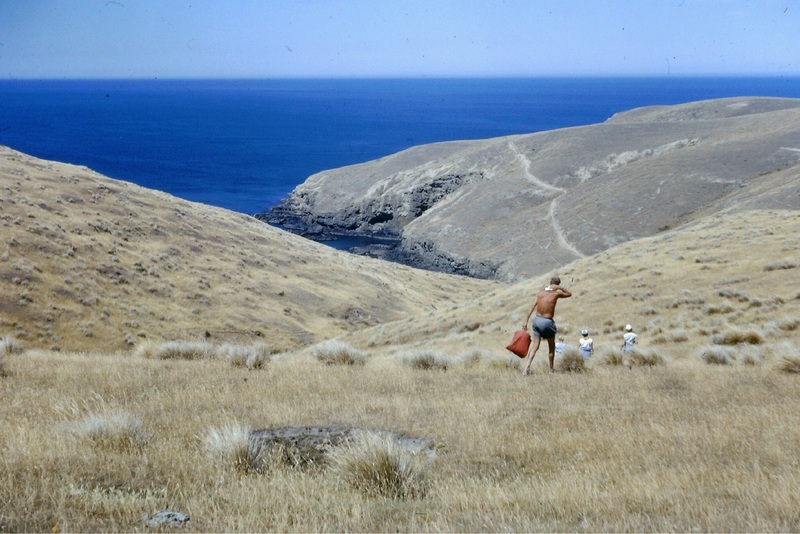 I’m not sure of the exact location, but love the image and looks to have been taken in the Banks Peninsula area”. Entry in the 2017 Christchurch City Libraries Photo Hunt. Knowlescourt, 274 Papanui Road, 4 March 2011. Kete Christchurch. Knowlescourt__274_Papanui_Road__4_March_2011___north_facade. Licensed under a Creative Commons Attribution-Noncommercial-Share Alike 3.0 New Zealand License. The former house at 274 Papanui Road, known as “Knowles Court” was built in 1910 for Christchurch solicitor, Thomas Gregory Russell and his wife Doris. It was designed in the Arts and Crafts architectural style by John James Collins of the firm Armson, Collins and Harman. The interior of the house was later converted into flats. 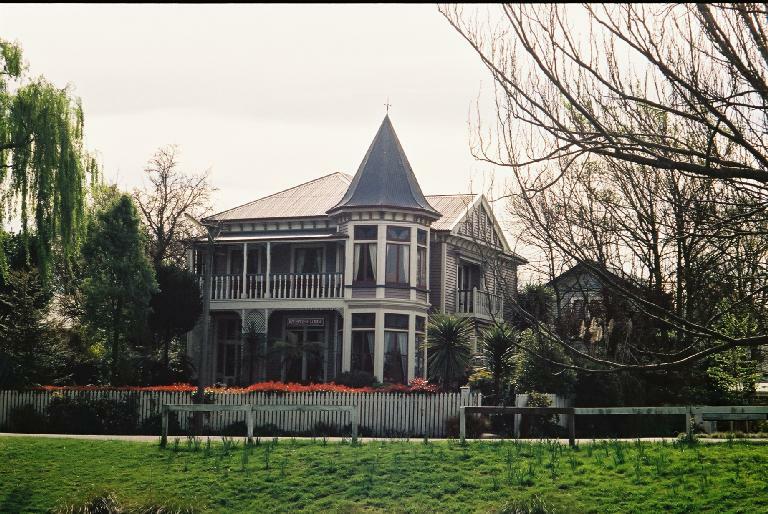 Although a heritage listed building, having sustained damage during the Canterbury earthquakes, the house was demolished in 2011. Do you have any photographs of 274 Papanui Road? If so, feel free to contribute to our collection. Dainty Inn, High Street by Patricia Scott, Kete Christchurch. StaceyBuildings-006. Licensed under a Creative Commons Attribution-Noncommercial-Share Alike 3.0 New Zealand License. Situated at 242 High Street, the Dainty Inn first opened in 1940 as a “milk bar and quick lunch business”. 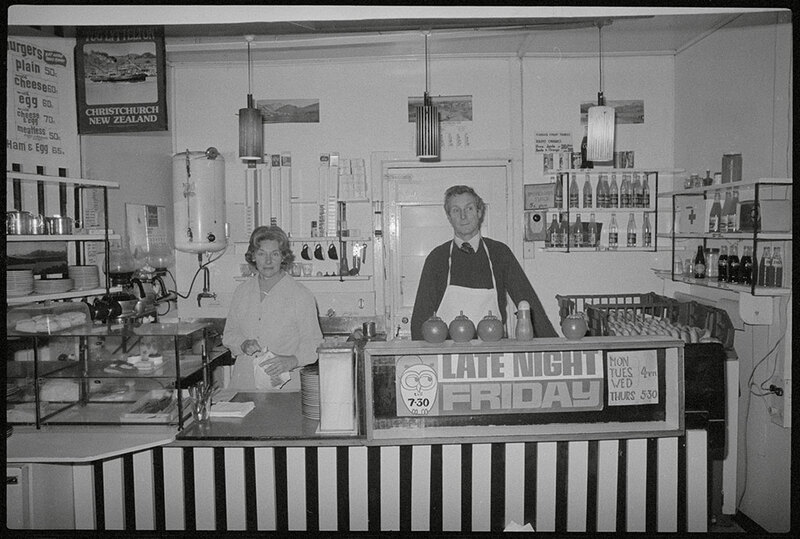 It was later purchased by James Michael Curnow (1922-2014) who ran it for 28 years. 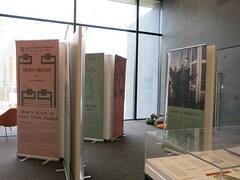 His recollections feature in Remembering Christchurch. Although it was not the only milk bar on High Street (the other being the Milky Way), part of its attraction was a pulley system which took orders to the kitchen. The business closed in 1989. This photograph shows a glimpse of neighbouring booksellers Simpson & Williams at the right, with Evans Footwear and Princess Restaurant at the left. 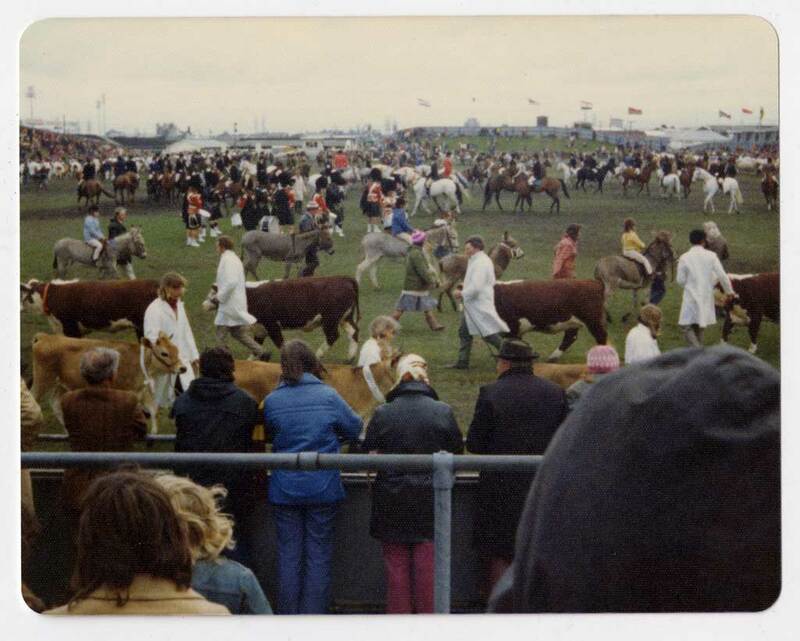 Do you have any photographs of the Dainty Inn or High Street? If so, feel free to contribute to our collection. Riverview Lodge, 361 Cambridge Terrace, Christchurch. Kete Christchurch. Cambridge_Terrace_361. Licensed under a Creative Commons Attribution-Noncommercial-Share Alike 3.0 New Zealand License. 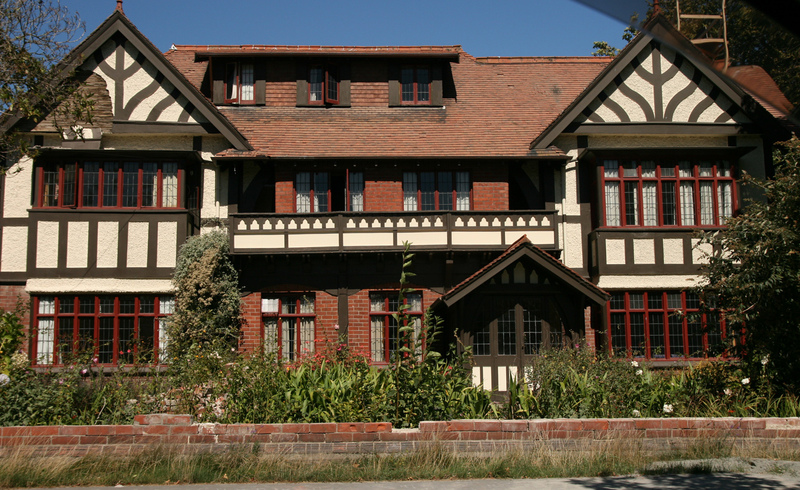 The house at 361 Cambridge Terrace was built c.1904 and is an example of a residence designed in the Queen Anne style of architecture. Do you have any photographs of 361 Cambridge Terrace? If so, feel free to contribute to our collection. The corner of Cashel and High Streets, Christchurch. CCL Photo Collection 22, Img00803. The corner of Cashel and High Streets, Christchurch [ca. 1880]. 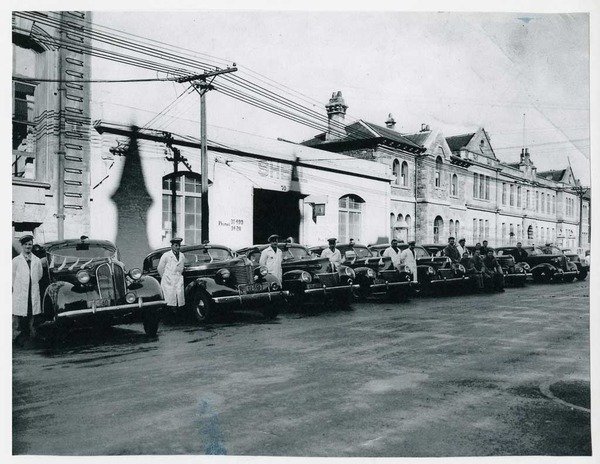 Cobb & Co. established their line of coaches in Christchurch in 1863. 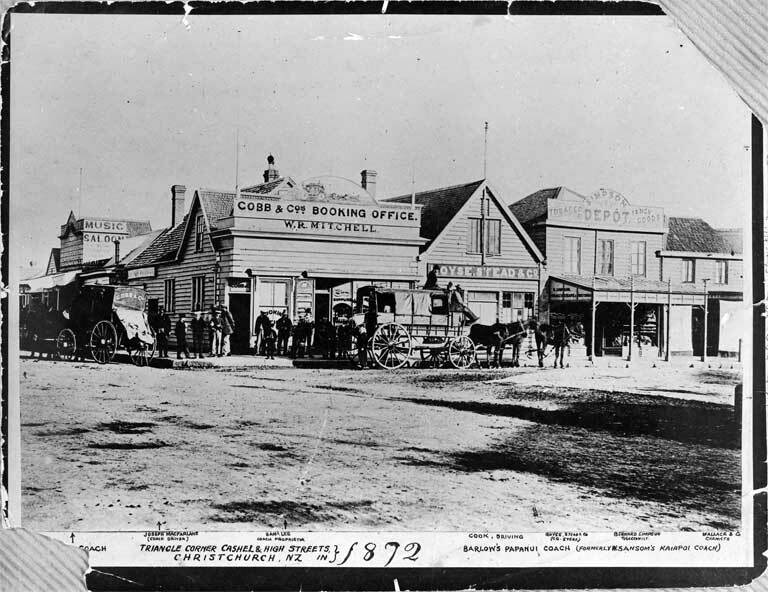 By 1864 their coach office was on the corner of Cashel and High Streets, facing east on the Triangle. The coach driver is thought to be Joseph McFarlane (1849?-1885). In High Street to the right of their depot are Royse, Stead & Co. (William Royse and George G. Stead), grain merchants and the Simpson depot (Bernard Simpson, tobacconist and fancy goods). The music warehouse of Spensley & Co can be seen on the left, in Cashel Street. 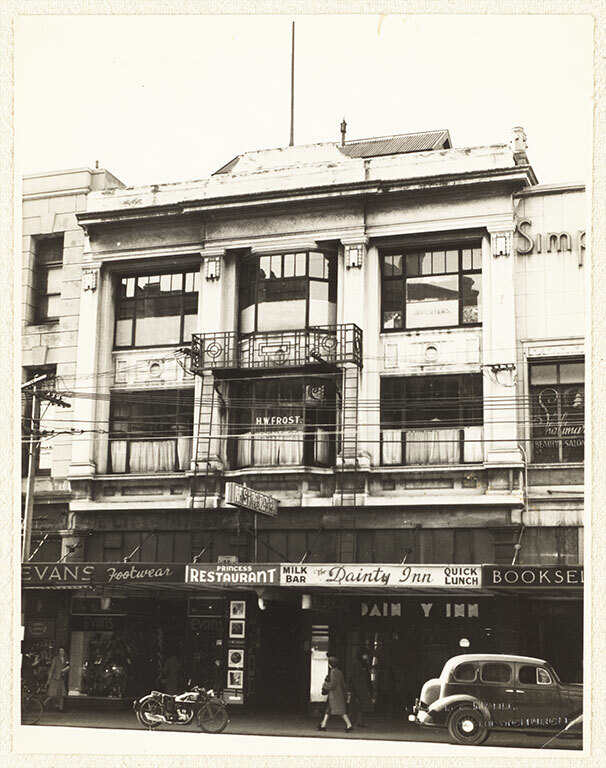 Do you have any photographs of the corner of Cashel Street and High Street? 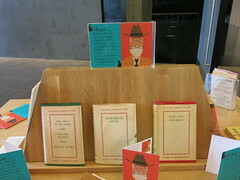 If so, feel free to contribute to our collection. Join us in a festive celebration of Christchurch photographic heritage as every day we find a new gift in our Christmas basket, Kete Christchurch. Maypole Dance. Kete Christchurch. PH16-127. 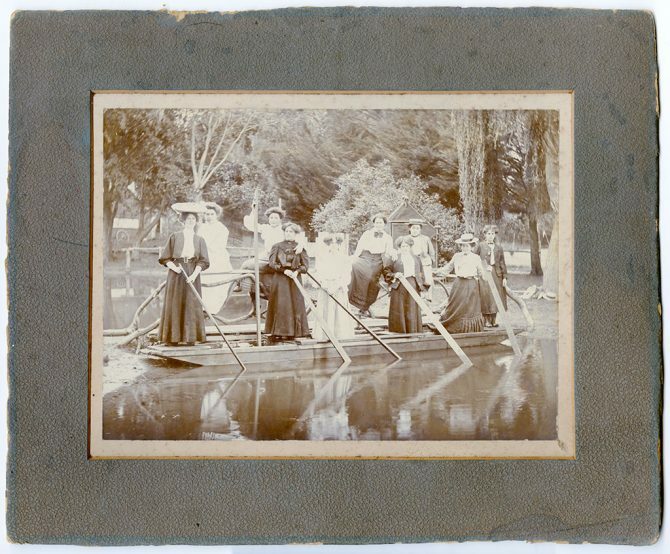 Ten Ladies punting on the Avon, Entry in the 2014 Christchurch City Libraries Photo Hunt by Johanne McMaster. Life Saving Team at Taylor’s Mistake by CCL Photo Hunt. 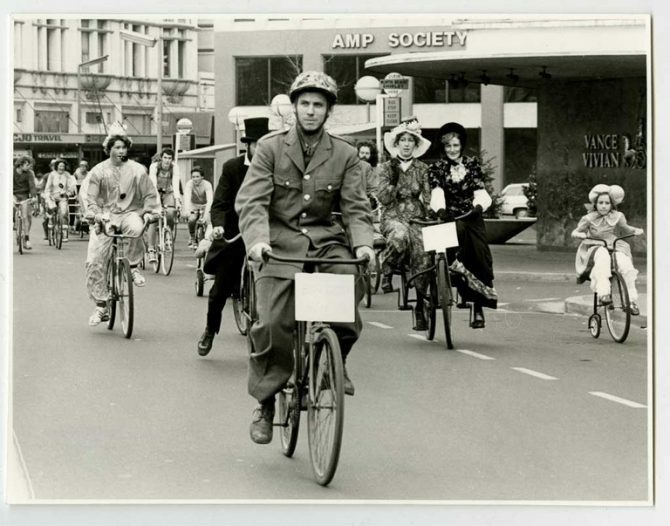 Got Christchurch and Canterbury images or stories of your own to share? Register with Kete Christchurch. 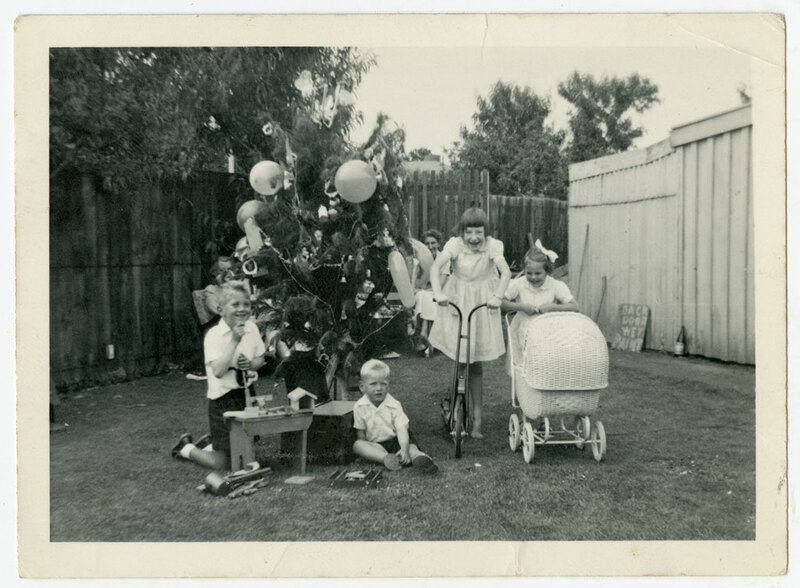 Christmas in the backyard, 1958. Kete Christchurch. PH13-410. Entry in the 2013 Christchurch City Libraries Photo Hunt. Licensed under a Creative Commons Attribution-Noncommercial-Share Alike 3.0 New Zealand License. Do you have any photographs of Christmas in Canterbury? 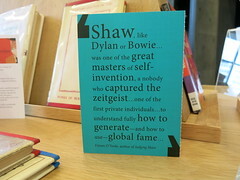 If so, feel free to contribute to our collection. It looks just like the original. Many might assume that an old friend has returned to New Brighton. But it is, in fact, a replica. 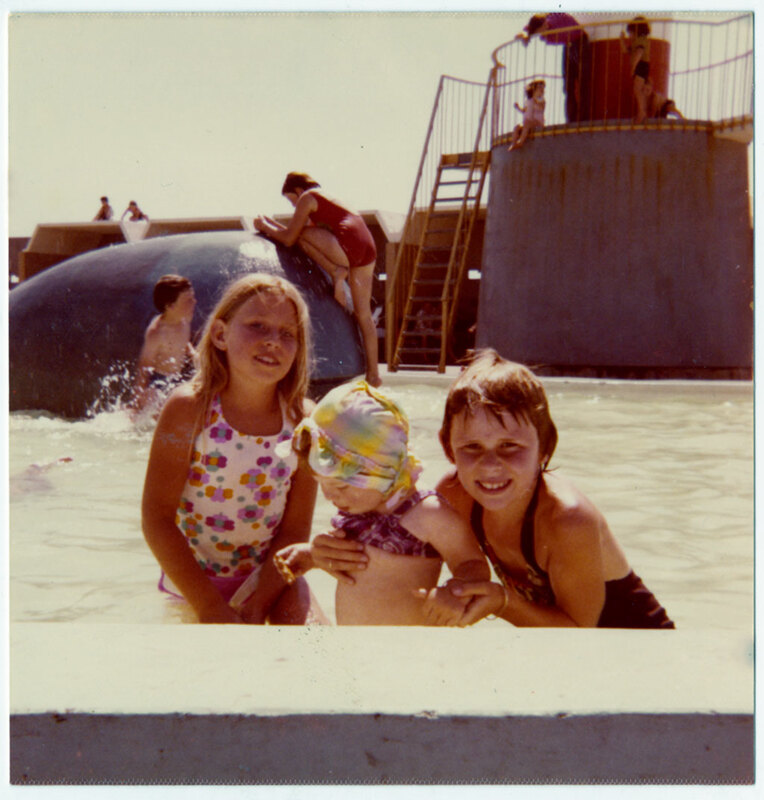 At the Whale Pool, 1970. Kete Christchurch. PH14-307. 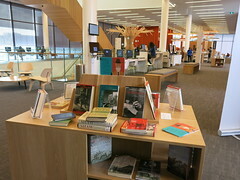 Entry in the 2014 Christchurch City Libraries Photo Hunt. Along with the lighthouse, the concrete whale has been an iconic feature of the pool at the New Brighton playground for over forty years. Known as the ‘whale pool’, such is the attachment that local residents have towards it, that when a survey was held in 2016, asking them what they expected from a redevelopment of the playground and pool, 90 per cent of the respondees stated that they wished for the whale to remain. 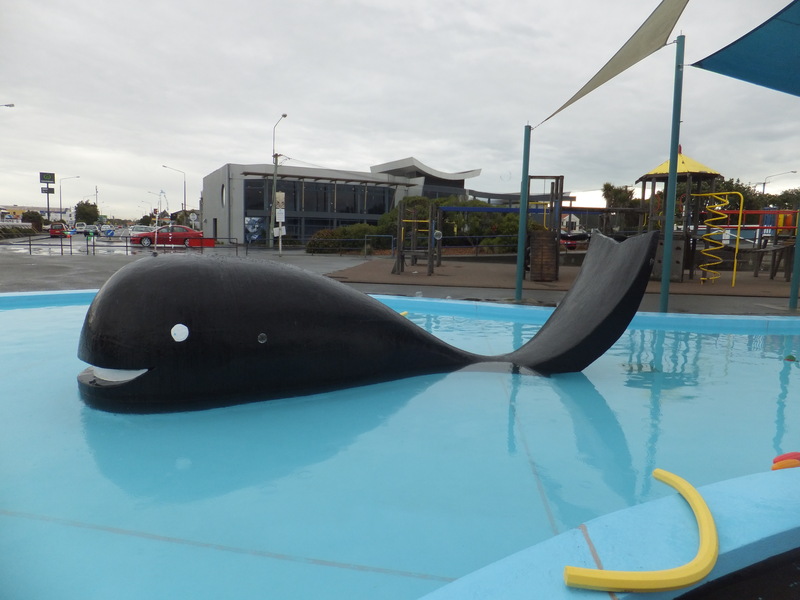 Children of Christchurch were first introduced to the whale in 1971, when, after years of planning, the playground opened on 16 December. 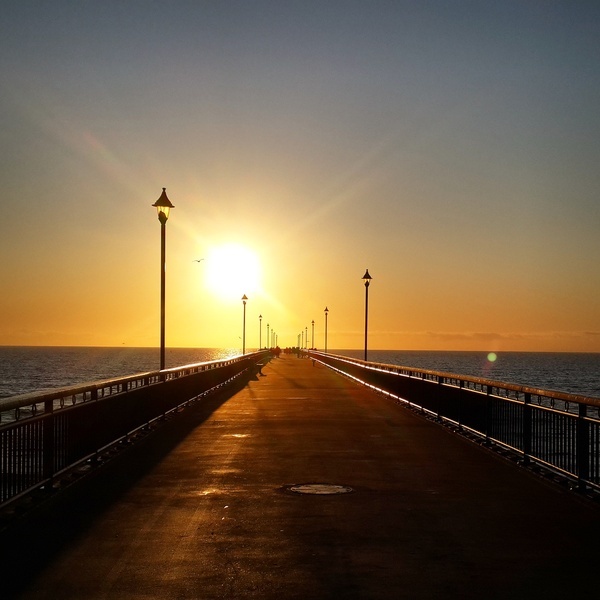 The origins of the playground lie in the formation of the New Brighton Pier and Foreshore Society which was established in 1964 to save the historic New Brighton pier (built in 1894) from demolition. 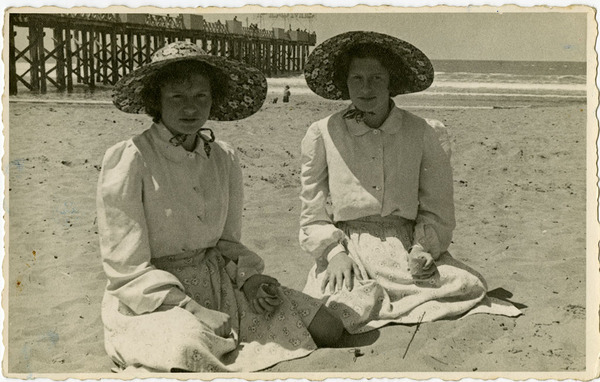 Although the pier was eventually demolished in 1965, the society continued to serve the community. In 1967 the organisation decided to build a children’s playground and pool. The northern carpark by the beach was chosen as the location, and in 1968 proposed designs were made. 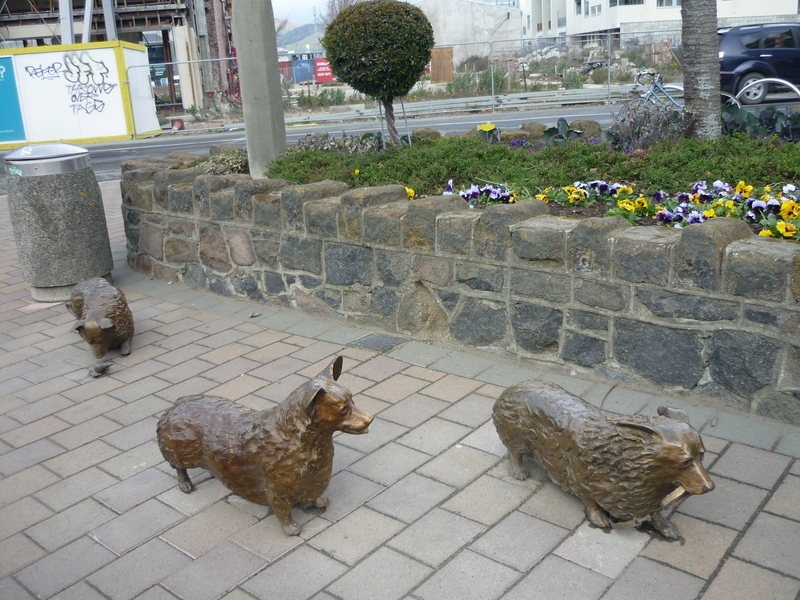 In the following year they were submitted to the Christchurch City Council but these were rejected as inadequate. To remedy this, the society hired a professional architect to bring their plans up to a required standard. Eventually these plans were scaled down, and when presented again to the council in 1971, they were approved. The pool and playground were completed in time for the summer holidays. Like many of the other paddling pools in Christchurch, the whale pool was damaged during the February 2011 earthquake. Repairs were made and the pool officially reopened on 17 November 2012. Whale Pool Re-opening Day – 17 November 2012. Kete Christchurch. Whale_Pool_Re-opening_Day_-_17_November_2012__DSCF3403. As early as 1998, there had been discussions surrounding the concept of a saltwater hot pool complex at New Brighton. After the restoration of the whale pool, the idea was raised once again. In December 2016 the council approved the funding for the Beachside Playground and coastal protection works to be carried out by Development Christchurch Limited. Construction on the new playground began in August 2017 after a sod turning ceremony was held. Although it was initially planned to keep the old whale (but with a new water jet installed), an engineer’s assessment found that it would not survive the relocation. Given that it was important for the whale to remain a part of the playground, a fibreglass mould was made and a replica whale produced. The ‘clone’ of the original was set into place on 5 December. The new playground (complete with replica whale) is scheduled to open on Wednesday 20 December 2017 at 10.30am. View photographs of the 2012 whale pool reopening in Kete Christchurch. Information on New Brighton Beachside Playground on Development Christchurch’s website. New Brighton Pier and Foreshore Society Facebook page. A 1920s bloke’s shed at 60 Aikmans Road, Merivale. Kete Christchurch. 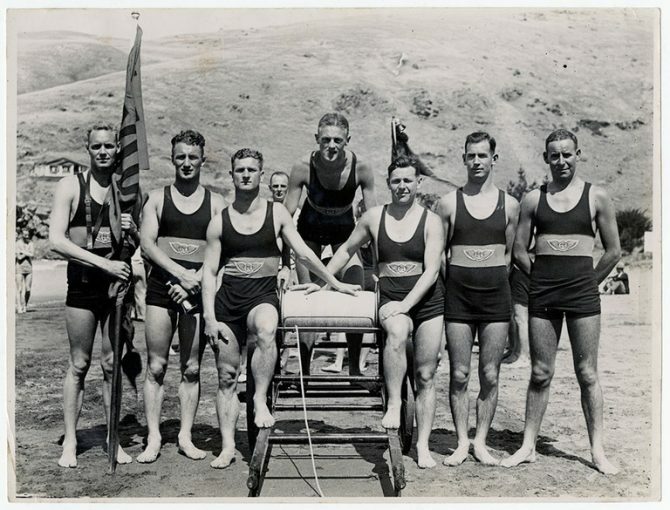 Pearce_family_photos_45. Entry in the 2013 Christchurch City Libraries Photo Hunt. Licensed under a Creative Commons Attribution-Noncommercial-Share Alike 3.0 New Zealand License. A 1920s bloke’s shed at 60 Aikmans Road, Merivale. 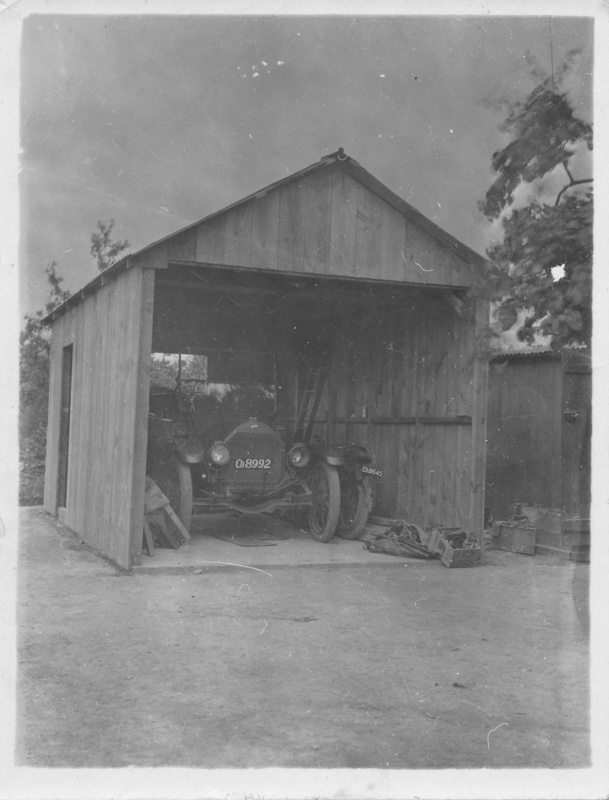 This shed held the prized family car, the motorbike, tools and was also used for the family business. Arthur James Pearce did his cobbler work in this shed. This shed was every 1920s mans dream, hence why it got its own photo! Taken by Arthur Cyril Pearce in about 1920.